By coincidence or grace, the first thing that I ever read on meditation was the English translation of the vijnana bhairava tantra by Paul Reps, contained in Zen Flesh, Zen Bones (Doubleday, 1957). It was 1968. I was 18, a freshman at the University of California. In the physiology lab where I worked, a woman graduate student happened to show me the book one day for a few minutes, because she was delighted with it. The verses reminded me of something I had experienced two months before, when I had participated in an experiment in which I sat in a totally dark room for three hours every day for three weeks. The study was about brain waves (EEG). The experimental subjects got brain-wave biofeedback. Someone had flipped a coin and my name was selected as a control subject; so I received no instructions whatever, no feedback. I was just wired up and left there in a room that was utterly blacked out and soundproofed. I had never heard of meditation, and I had never sat in a dark room for several hours before, so I simply noticed what was going on. Gradually my senses opened up in ways that I had no words to describe. After walking out of the lab each afternoon, I felt refreshed and wonderful. It was as if my entire previous life had taken place in a mild sleep state, and now I was really awake. Everything alive seemed to glow, especially the trees. I felt in love with existence. It was as if I had never seen the world before. I began to appreciate every detail of light, every touch of air, every sound, in a way I had never imagined. The feeling was somewhat similar to the joy I had after surfing or sailing my catamaran on the ocean all day, but much more intense and steady. Even taking calculus tests was easier; my mind was so lucid that I could remember a formula that I had simply looked at the night before, and then derive its applications right there during the test. This heightened sensing lasted for weeks after the experiment was over. Then the woman, whom I knew only slightly, handed me the little book. It seemed to speak right to the heart of those experiences that I underwent while sitting in the dark room and afterwards. Since she wouldn't lend it to me I immediately went out to a bookstore and bought it. My entire approach to teaching meditation the last 40 years has been influenced by these insights. When I am “teaching” meditation what I am really doing most of the time is listening to people talk about their inner worlds, their longings, their sensory worlds. During these sessions, it seems, eventually everyone spontaneously goes into something resembling one of these hundred and twelve meditation techniques. What I do is notice when the person has entered meditation, and after awhile I ask them to describe to me in their own words how they got there. The shift into meditation is so natural that people often don't notice it until a few minutes later. Sometimes toward the end of a session the person might say, “You know, I haven't remembered this for years, but as a child I used to do a special thing. . . and then they describe something with breath, or with movement, or with looking at the sky, that they made up or that occurred to them. Year after year, I hear people who have not read the yoga literature repeating in clear detail one or more of these classic meditation techniques. I now take it for granted that many, many people make up or rediscover these practices. What a meditation teacher can provide is a context for people to learn from their own experiences. I have adapted the text freely to bring over into modern English some of the sensuousness of the original Sanskrit, which is luscious, resonant and evocative. These sutras have the feeling of one richly experienced body speaking with love to another body. This is the kind of language that is useful if you actually want to do the techniques, rather than to just know intellectually what they are. There are several translations into English of this tantra that I worked with. What I have done is to reinterpret their work and present a new version which contains some of the qualities of each. Paul Reps published one, mentioned above, in Zen Flesh, Zen Bones. Another is by Jaideva Singh, Vijnanabhairava, published by Motilar Banarsidass, Delhi, India, 1979. * Jaideva's version has been re-published by State University of New York Press, Albany, 1991, with the fabulous subtitle, The Yoga of Delight, Wonder and Astonishment. Both of these writers learned the teaching directly from Lakshman Joo, a meditation teacher who lived in Kashmir in this century. They took very different approaches to translation. Paul Reps, in his introduction to the sutras, said that he started with an English version by Lakshman Joo, and then did eleven more drafts until he got it into the form that he published as “Centering.” The whole text is only fourteen pages, about nine sutras per page. The English is beautiful and simple. It has a somewhat beatnik flavor to it. Jaideva Singh's translation and commentary is detailed and explains the techniques more fully, with many notes, footnotes, asides, and explanations of technical terms. It has a scholarly, academic flavor and a wealth of references. In other words, it is almost impossible to read. I drew on it intensely in creating my version and am deeply grateful for his scholarship. Although it is educational in an academic way, the language tends to be technical and not at all like the feeling tone of the original Sanskrit. Yet Jaideva Singh is being true to the tradition of translation that says accuracy is desirable at the expense of readability. Nabokov, the great Russian writer, embraced this “unreadable” theory of translation fully: “I want translations with copious footnotes, footnotes reaching up like skyscrapers to the top of this or that page so as to leave only the gleam of one textual line between commentary and eternity.” He called one of his own translations “monstrously literal.” There are quite a few translators of meditation texts which agree with this school of literalism. My approach is at the other end of the continuum from that employed by Singh. I used the simplest possible language and no technical terms. I attempted to describe in sensory detail what the meditation techniques are while conveying the playfulness and wonder of the original, which flows more like love-talk than an academic text. I attempted to enter the world of the Bhairava Tantra and to look out through its eyes and listen with its ears. All I have done is to take these two rich translations and let them teach me over a period of years. Then I listened very carefully to the resonance, the mantric quality of the Sanskrit sounds in the original as it set up vibrations in my nerves. Following the tracks of these sounds as they faded away, I noticed what arose in me in the vibrant silence they created. I sought to let this resonance give me fresh language for the sutras. The sutras direct attention to subtleties of relationship among the senses, the emotions, energy flows in the body, and the relationship of the body and space. “Pay attention to the flow of desire itself, as well as the objects of desire,” the teaching says. These are physical, interesting and embodied experiences. There is nothing “other” or “esoteric” about them: they are everyday kinds of experiences, ecstasies and enlightenment. Although technical and Sanskrit terms can be used - “kundalini,” “dharana,” “chakra,” or “nadi,” for example, they add very little to the discussion, except for those few experts knowledgeable enough to discourse upon them. “I have learned Sanskrit, let all men call me wise,” says Kabir. There remains the question of how to really translate these teachings into a living reality. What we need to learn is how to live with passion and serenity, what to do about unfulfilled desires, how do I make all this work in today's society, and what about my relationship to my wife or husband or lover? This is my twentieth draft or so. I have lost count. It is continually being fine-tuned because as I mature, I find new language. Each of the techniques is a silent awakening and there are many ways to point to it in the English language, none of them perfect. Each line of Sanskrit is evocative of at least half a dozen meanings, and has layers and layers of meaning. This is just one of twenty or thirty ways of reading the text. Most of the work was done before dawn, standing at my desk or walking around the room, which looks out over a garden near the ocean. The early morning, several hours before dawn, is called navaswan in Sanskrit and I find that it is the freshest time for this type of work. For eight months, I got up at three or four o'clock, picked a sutra and paid attention to it for half an hour or so. I let the experience described in the text hit me and then I sought English words that articulated the experience. Softly I would chant in Sanskrit and savor its sound for awhile, and then let it echo inside me, moving energies around in my body until I started to get corresponding English words. I looked up the root structure of the words to track how they metamorphosed over the ages from Indo-European through Greek and Latin into modern English. I was like a hunter following a trail through a forest wet with dew, in the lively darkness before dawn, knowing that just around the hill over there I would find what I was seeking. Sanskrit means “perfect” or “artificial,” because it is so finely crafted. It was designed for use in the oral tradition, in which important meditative texts and revelations are memorized, chanted and passed on over many generations. Sanskrit is consciously onomatopoeic: if you listen to it sensitively, something in the sound of the words and rhythm of the chanting evokes in you a feeling of what is being spoken of. Every word of a Sanskrit sutra resonates simultaneously on all levels: physical, sensual, emotional, mental and spiritual. In so doing, it evokes a vibrational integration or correspondence among all these levels. Because of this multidimensionality, there are endless possibilities for jokes, plays on words, double entendre and multiple entendres. Sometimes when I am chanting the Bhairava Tantra to myself at four in the morning, wondering about the layers of meaning it contains, I come across these little jokes of multiple resonance and start laughing. It is similar in feeling to listening to fusion music, Brazilian music for example, in which elements of rock 'n roll, jazz and Samba are seamlessly woven together into one vibrant whole. I do not know Sanskrit in a scholarly sense, I would not even say that I am a beginning scholar. I am a lover of the language, that is all, and I rely on the hard work of the Sanskrit scholars to rend the works into English and set forth the grammar. I then work over their English so that it makes more sense from the point of view of someone who loves meditation. There is some scholarship in it, for I look up the root words of the source text in a Sanskrit dictionary and also trace the roots of English words in an etymological dictionary. But my main concern is not that my writing be true to the text, rather that it be evocative of the experiences people have when doing the techniques. So there is no “scriptural authority” to this version. Lilian Silburn and Jaideva Singh have both produced authoratitive translations, with a lot of over-the-shoulder help from Laskshman Joo himself. This is just “Lorin's take” on the tantra. Like no other language I have ever heard, Sanskrit is a song of the union of opposites. The opposites embrace each other, as lovers do, as the eternally fascinating polarity of female and male, day and night, sun and moon. Meditation is an integration, not obliteration of the opposites or mere transcendence of them. It is an alchemical union in which each exists in its fullness and in a relationship of complementarity with the other. The Sanskrit sings of rhythm, vibrancy, the transmutation of terror into ecstasy, fear into movement, stasis into electricity, flow, tenderness, intimacy with oneself and the universe, informality, attentiveness and responsiveness. I do not like to hear Sanskrit spoken out loud except on very rare occasions. I prefer to hear it resonate in the deep spaces of my heart and my nerves. There are other tantras in which it is Shiva asking the questions and Devi giving the teaching. He starts out by listing a dizzying number of sacred texts, and then says, “O Luscious-hipped One, if you love me, teach me their essence.” Devi then gives a teaching which is if anything even more stunning in its simplicity than is the bhairava tantra. What is amazing is that these teachings have survived at all. It is a tremendous accomplishment of Indian civilization that they have preserved the texts over time, even if they are scandandalous. A thousand pujas on behalf of the spirits of all those who have worked so that these teachings still live. All of my books are inspired by the Vijnanabhairava Tantra. You may find useful meditation tips and explorations in all of them. Camille Maurine and Lorin Roche, Meditation 24/7, Andrews McMeel, 2004. Lorin Roche, Meditation Made Easy, HarperSanFrancisco, 1998. Lorin Roche, Whole Body Meditations, Rodale/St Martin's Press, 2002. Lorin Roche Breath Taking: Lessons in Breathing to Enhance Your Health and Joy of Living, Rodale/St Martin's Press, 2001. Lilian Silburn, Le Vijnanabhairava Tantra. It is in French, but I like her translation the best. “Centering” in Zen Flesh, Zen Bones. Available in several editions, including: Anchor Books, 1989, ISBN 0-385-08130-8. The Yoga of Delight, Wonder and Astonishment. Jaideva Singh. State University of New York Press, 1991. ISBN 0-7914-1073-0. Mike Magee has created a wonderful website, shivashakti.com, and posted a minimalistic version of the text here. Lorin Roche received his Ph.D. in Social Science from the University of California at Irvine in 1987. His Master's Degree work focused on the hazards of meditation and the crisis points in a meditator's development. His Ph.D. research was about the language meditators develop to describe the richness of their inner experience. Dr. Roche has been exploring, researching and teaching meditation since 1968, when he began meditating and training other as part of physiological research. Later, he was trained as a teacher of the Transcendental Meditation Technique by Maharishi Mahesh Yogi and from 1970 through 1975, he taught that technique. During that time he worked with people on high school and university campuses, in hospitals, on military bases, in think tanks, retreat centers and private homes. Starting in 1975 he began developing new methods for instructing people in meditation. This approach, which he calls Instinctive Meditation, works with the fine structure of individual uniqueness, rather than using a standardized approach. Instinctive Meditation tends to feel more like an innate skill that you are remembering than a technique that you are learning. Lorin's work is aimed at activating people's internal guidance systems and bringing forth their instinctive knowing, so that they can safely practice meditation without being dependent upon Gurus, systems or external authorities. Lorin is also the author of Meditation Made Easy, HarperSanFrancisco (1998) Meditation Secrets for Women HarperSanFrancisco, (2001); Breath Taking Rodale Press (2001), Whole Body Meditations Rodale Press (2002) and Meditation 24/7 Andrews McMeel (2004). *Thank you, Bill Marx. One day in the 1980's, I was walking through the Siddha Yoga center in Vancouver, British Columbia. One of the monks at the center struck up a conversation with me, and I mentioned that I was a lover of the vijnana bhairava tantra. He said that a version had just been published in India, with a foreward by his guru, Swami Muktananda. A month later, the book arrived in the mail. 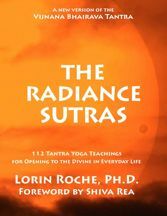 A new printing of The Radiance Sutras just arrived!